Seminole County Animal Services staff members found a dog and cat, two best friends huddled together on the side of a busy road near their Florida shelter. Their former owner abandoned them in front of a gated community, perhaps hoping a wealthy resident there would take pity on the animals. 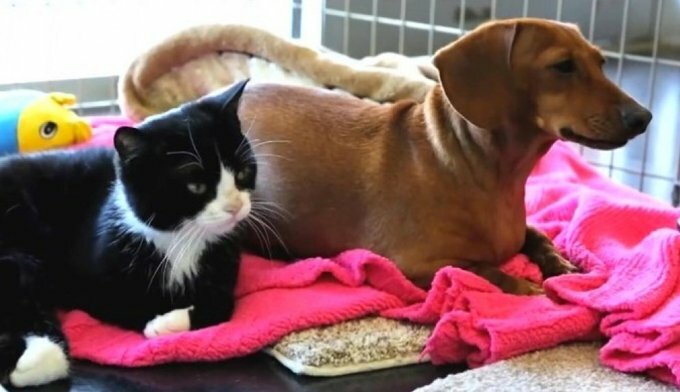 As the animal services worker approached the pair, the dog, a 2-year-old Dachshund named Idgie, moved in closer to the cat, guarding her friend. Idgie barked and growled, acting as the kitty’s fearless protector. And the 7-month-old cat, Ruth, was dragging herself along by her front legs, her back legs completely unusable. When Idgie and Ruth arrived at the shelter, they were both in decent condition, aside from Ruth’s partial paralysis. Idgie was clearly well-fed, if not a little pudgy, and Ruth appeared in good spirits, in no pain despite her twisted back paws. The shelter contacted a local nonprofit organization called TEARS — Together Every Animal Receives Support — hoping they could provide Ruth with some assistance for her unusual health condition. But the expensive acupuncture and therapy sessions had no effect on Ruth’s paralysis. And, what’s more, whenever Ruth would leave Idgie’s side for her medical treatments, Idgie became irritable, frantic. “It was like she was constantly looking for her,” Gagliano explains. 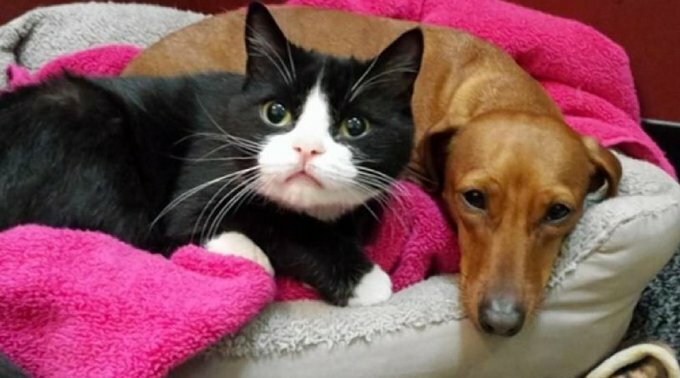 Everyone at the Animal Services Shelter could tell Idgie and Ruth were a bonded pair, and no matter what they were a package deal. Any potential adopter would have to consider bringing both pets into their home or walk away. On a hunch, Gagliano and her staff contacted Jacqueline Borum, a local animal lover and owner of a nearby pet-grooming salon called Hollywood Houndz Boutique and Spa. Over the course of six years, Borum has fostered and found forever homes for 1,300 dogs and cats. Borum met the pair and fell in love immediately. Now, months since they were found on that busy road, Idgie and Ruth cuddle together in the lobby of Borum’s grooming shop. And Idgie is just as protective of Ruth as ever, explains Borum. “Idgie would take a bullet for that cat,” Borum adds.